The church of Sv.Mihovil (St. Michael), as parish and the main church replaced the medieval church which was too small for citizens of Omis, so they had decided, in year 1604, to renew the old one and to built the new, aisled, more spacious church with presbytery. The construction of belfry, which is raising above the rock behind the main parish church, had started in 1720, and was completed in 1724. 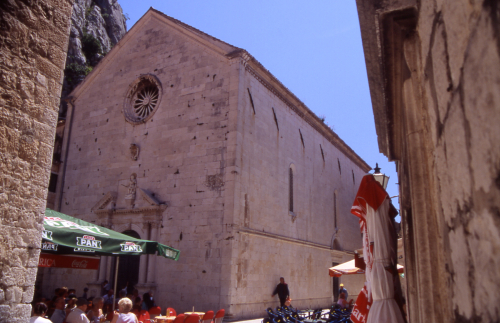 Parish church of Sv.Mihovil (St.Michael) is one of the Omiš's most important architectural heritage. It is a combination of Gothic, Renaissance and Baroque styles, while portal, as one of the most interesting art achievements in Dalmatia in that time is an expression of folk mannerism. Among the plenty of artistically shaped and valuable objects, the most valuable and the most famous are four altar pale: Descent of the Holy Ghost, Sv. Stjepan Prvomucenik (St. Stephan), Our Lady of Ružarje and Our Lady with Child, Sv. Juraj (St.George) and Sv. Jelena (St. Helena). of them were made and brought to Omis during the construction and decoration of the church. They were made by Venetian artist Palmo junior’s group. The Crucifix on the altar of St. Cross, made by sculptor Juraj Petrovic, as well as altars of Our Lady and Sv.Mihovil (St. Michael), made by sculptor Ivan Rendic are also very valuable artefacts. At the end of the main street is a small church of the Holy Spirit from the 16th century; the Renaissance wooden altar features the painting Descent of the Holy Spirit by the Venetian painter J. Palma the Younger. The church was built in 1585., on the remains of the older, gothical church. Church of Sv. Petar (St. Peter) in Omiš. Church St. Petar at Priko – the one of the rare Pre-Romanesque buildings in Croatia, built in X. century and well preserved until now days. Located on the right bank of the Cetina river, it is first mentioned in the documents in the year 1074., during the reign of the king Slavac. In the early 17. century the family Deškoviæ alias Bonizio erected a chapel in the immediate vicinity of the town, dedicated to St. Luke the Evangelist. The cemetery chapel was built at the request of the noble Luka Bonizio out of the town, on the communal ground of the cemetery of Our Lady. Though of the modestly adorned exterior and under the strong influence of the Gothic tradition in the interior, it was ment to give a touch of nobility to the outskirts of the town and the cemetery; however,it did not manage to become an important part of the religious tradition and live in the collective memory of the citizens of Omiš. - The Franciscan monastery, built in the 18th century, has a collection of works of art, the archives containing Turkish documents and a library.